^ Alasalvar, Cesarettin; Shahidi, Fereidoon. 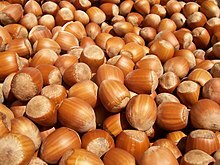 Tree Nuts: Composition, Phytochemicals, and Health Effects (Nutraceutical Science and Technology). CRC. : 143. ISBN 978-0-8493-3735-2. ^ Black, Michael H.; Halmer, Peter. The encyclopedia of seeds: science, technology and uses. Wallingford, UK: CABI. 2006: 228. ISBN 978-0-85199-723-0. ^ 3.0 3.1 堅果多吃易胖 增罹癌風險. 蘋果日報. ^ 适合减肥吃的坚，,减肥可以吃每日坚果吗，吃什么坚果减肥. WebMD. [2018-11-24] （中文（中国大陆）‎）.